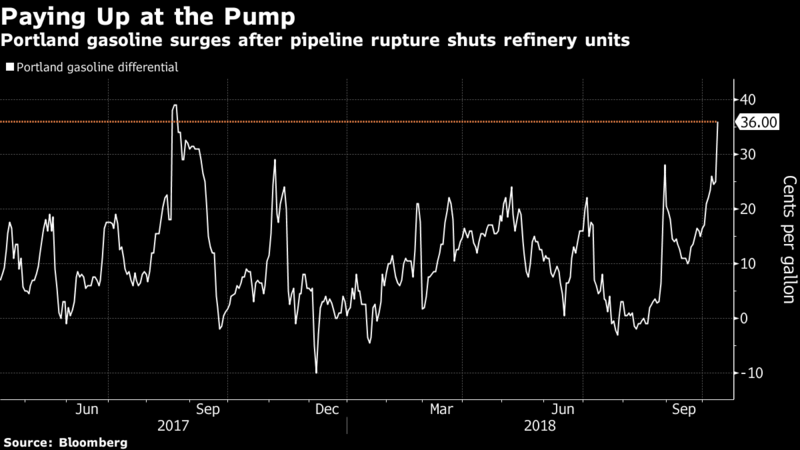 A natural gas pipeline rupture in British Columbia is forcing refineries in Washington to cut output, pushing gasoline prices higher in the Pacific Northwest. Enbridge Inc.’s WestCoast Mainline ruptured near Prince George late Tuesday, the company said in a statement. The line carries gas to refineries in Washington state to operate units that process crude oil into gasoline, diesel and other fuels, as well as to utilities in the region. Royal Dutch Shell Plc said it’s shutting units at its Puget Sound refinery north of Seattle after losing its gas supply and Phillips 66 shut its refinery in Ferndale, Washington, according to the local fire department. They’re among at least four refineries in the region that have been affected. Canada’s National Energy Board issued an order late Wednesday local time allowing Enbridge to restart the adjacent line at reduced pressure, the regulator said in a statement on its website. The company can later apply to resume full pressure. The company will only be allowed to restart the damaged line when the regulator is satisfied it can be operated safely, it said. The line carries gas to refineries in Washington state to operate units that process crude oil into gasoline, diesel and other fuels, as well as to utilities in the region. Royal Dutch Shell Plc said it’s shutting units at its Puget Sound refinery north of Seattle after losing its gas supply and Phillips 66 shut its refinery in Ferndale, Washington, according to the local fire department. They’re among at least four refineries in the region that have been affected. Wholesale gasoline in Portland, Oregon, jumped 11 cents Wednesday to 36 cents a gallon over New York-traded futures contracts, the highest level in more than a year, according to data compiled by Bloomberg. Diesel gained 5.75 cents. Retail market analyst GasBuddy issued an alert on Twitter that pump prices in Washington and Oregon could jump 15 to 30 cents a gallon over the next week. California prices also strengthened on speculation that fuel will be sent north along the coast to Seattle and Portland. San Francisco prices climbing 5 cents a gallon. The Enbridge pipeline is part of its WestCoast Energy network, and carries as much as 2.9 billion cubic feet of gas a day -- supplying half of the demand from Washington, Oregon and Idaho -- from the Fort Nelson processing plant in northern British Columbia to the U.S. border. The 1,751-mile (2,818-kilometre) line connects to gas fields as far north as the Yukon and Northwest Territories. Wholesale gasoline in Portland, Oregon, jumped 6 cents Wednesday to 31 cents a gallon over New York-traded futures contracts, the highest level in more than a year, according to data compiled by Bloomberg. Canadian crude sank to record lows relative to the U.S. benchmark, according to market participants. The refineries in northwest Washington receive oil from Alberta via the Trans Mountain pipeline, and any reduction would add to a glut in Canada. The Enbridge pipeline is part of its Westcoast Energy network, and carries as much as 2.9 billion cubic feet of gas a day -- supplying half of the demand from Washington, Oregon and Idaho -- from the Fort Nelson processing plant in northern British Columbia to the U.S. border. The 1,751-mile (2,818-kilometer) line connects to gas fields as far north as the Yukon and Northwest Territories. --With assistance from Barbara Powell, Lucia Kassai, Robert Tuttle and Brian Eckhouse.